When you’re looking for a fresh start after a water emergency like a flood or sewage backup, turn to 911 Restoration Imperial County for our quality water damage repair and restoration. Over time your pipes and water-based appliances can start showing signs of wear and tear which can make your home vulnerable to leaks. Fortunately, our water damage La Quinta specialists can give you the assistance you need through all water damage incidents and needs. We know that water damage can strike unexpectedly, but with the La Quinta water mitigation’s 45-minute response time, you get the help you need right away. Using our advanced water removal and drying technology, we can extract water and moisture out of your home effectively, preventing mold and permanent structural damage. If your home or office location is already taking on flooding from a toilet overflow or ceiling leak, then contact our water damage La Quinta experts with 911 Restoration Imperial County today! Water damage can strike in many ways and in different forms. From the La Quinta water mitigation crews experience, our technicians can provide you with tips that can help you prevent various issues from occurring. Always keep your gutters and downspouts clear – regularly cleaning your gutters ensures that water is redirected away from your home unobstructed. Through cleaning, you can avoid issues like roof leaks and foundation damage. Inspect your roof on a regular basis – Your roof is your home’s first line of defense against the weather. Keep an eye out for roof issues like missing or damaged shingles. By taking action early on, you can prevent ceiling leaks. Watch out for excess moisture – Excess moisture is an indication that there isn’t enough attic ventilation. Working to keep your attic well ventilated prevents mold growth. Keep your plumbing up-to-date – Overtime, your plumbing could eventually crack, rust, or leak. 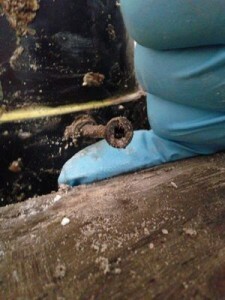 Through plumbing updates, you can prevent pipe bursts from occurring. Of course, when you’re faced with a water emergency, get in touch with our La Quinta flood removal techs right away. With our experience, quick response, and year-round availability, you can count on us to be there to handle any water-related issue you may have. Allow our La Quinta water extraction specialists patch up that leak and give your home a fresh start through quality water damage repair and restoration. Give us a call today and let us give you and your family a fresh start. Don’t let your lovely home or storefront succumb to the devastating effects of a pipe burst or ceiling leak. 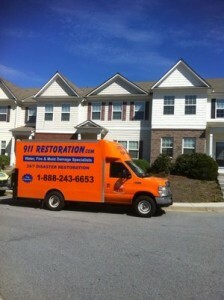 Contact our water damage La Quinta team with 911 Restoration today! Once our team arrives, you can expect them to provide you with a free home damage estimate and visual mold inspection so we can pinpoint the source of the problem in order to get a better understanding of the issue. No matter when those problems strike, the water damage La Quinta pros are available 24/7/365 to help you deal with any water-related issue. Rest assured that your home will be given a fresh start through our water damage repair and restoration from our IICRC certified technicians. If your home or business is already taking on flooding from a pipe burst, water heater loss, or any kind of ceiling leak, then contact our water damage La Quinta team today!